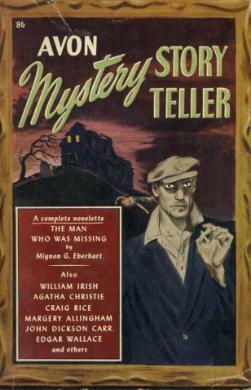 The Avon Mystery Story Teller (1946) edited by Joseph Meyers and E. B. Williams is a collection of mystery and mayhem ranging from Agatha Christie's "The Jewel Robbery at the Grand Metropolitan" (1925) to "The Old Man in the Window" (1946) by Margery Allingham. These and other well-known authors such as John Dickson Carr and Mignon G. Eberhart are joined by authors who may not be quite so familiar to the average reader--like J. S. Fletcher and Michael Fessier. [Although faithful readers here on the block will have noted a recent review of Fletcher's The Middle Temple Murder. ]These are stories of murder and spine-tingling adventure. And, of course, as with all collections, some are better told and more spine-tingling than others. (For instance, "The Man in the Black Hat" by Michael Fessier really doesn't seem to belong here--it's more on the fantastic side than the mysterious. But over-all this is a very fine collection. ★★★★A run-down of the stories:"The Old Man in the Window" by Margery Allingham: Stanislaus Oates has just been promoted to Superintendent and he and Albert Campion are out for a bit of celebration. During the course of their dinner, they witness a love triangle involving Denise Warren, Arthur March, and Rupert Fielding, a brilliant young surgeon. The lady in the case breaks up with her fiance (March) and it isn't long before a wedding is announced between Warren and Fielding. But then, complications arise--an elderly member of Campion's club, whose traditional seat has been in the window of the establishment, is found to be ill and later pronounced dead by Fielding (also a member). Scandal...and more...erupts when the victim comes back to life. "Death by Accident" by Francis Cockrell: Henry Earle, an assistant cashier, decides to run off with $150,000 of the bank's money. But before he can make good his get-away, his rented car is found in flames over an embankment...with a body inside. Detective Joe Mudd, smells a rat, especially when there is no trace of the money (in ashes or otherwise). And even though the teeth say it's the cashier, Mudd begins to wonder. But if it isn't Earle...then where did this body come from? "The Silver Curtain" by Carter Dickson: Jerry Winston is having terrible luck at the gaming tables. Then a man comes along and offers him ten thousand francs to just go to a doctor's house and pick up some pills. Sounds like an easy way to earn some cash. But then that same fellow winds up dead with a knife in his back outside the doctor's establishment....and there's one around but Jerry. And he didn't do it. Fortunately, Colonel March of Scotland Yard is on hand to explain. "The Man Who Was Missing" by Mignon G. Eberhart: Susan Dare takes up residence in a rooming house to discover how a ballerina's fiance could disappear from a locked house. "The Man in the Black Hat" by Michael Fessier: A very weird little story about a man whose luck changes when he accepts a "free car" from a man in a black hat like our hero "used to wear when the horses ran right or the stock market chart didn't look like a cross-cut saw." Everything goes swimmingly, until he decides to ask the man who he is. He doesn't actually find out...and maybe that's a good thing. "His Heart Could Break" by Craig Rice: Why did Paul Palmer, accused murderer, hang himself just when his lawyer John J. Malone had managed to get him a new trial and another chance for an acquittal. The key just may be in an old prison song..."Three O'Clock" by William Irish: A jealous man is convinced that is wife is meeting a lover while he's at work at his watch-repairing shop. So, he decides to set up a nice little time-bomb surprise for her...at three o'clock. But a set of burglars manage to throw a wrench in the works. "Treasure Hunt" by Edgar Wallace: The deceptively mild mannered detective, Mr. J.G. Reeder uses the legend that all detectives are on the take and have a secret treasure somewhere as a cunning plan to set a thief to catch a murderer. "The Lighthouse on Shivering Sand" by J. S. Fletcher: Murder comes to the lighthouse when two mortal enemies are assigned to duty at the same time. The third man devises a plan to keep them apart, but when a man is determined...."The Jewel Robbery at the Grand Metropolitan" by Agatha Christie: Poirot and Hastings are on holiday at the grand hotel when they meet a wealthy stockbroker and his wife. After Poirot amuses them with stories of cases which have involved some very famous jewels, the wife rushes off to retrieve her one-of-a-kind pearl necklace. But--it has disappeared! There are only two people who could have taken it...but they both appear to be innocent. Leave it Poirot to find the culprit. "The Proverbial Murder" by John Dickson Carr: Dr. Gideon Fell takes on the impossible shooting of a suspected German spy. It all depends on a stuffed wildcat, the use of a gun that couldn't have made the fatal shot, and....Fell's memory of a proverb.First posted on my blog My Reader's Block. Please request permission before reposting. Thanks. Margery Allingham Francis Cockrell Carter Dickson Mignon G. Eberhart Michael Fessier Craig Rice William Irish Edgar Wallace - Aka Maxwell March.Margery Louise Allingham was born in Ealing, London in 1904 to a family of writers. Her father, Herbert John Allingham, was editor of The Christian Globe and The New London Journal, while her mother wrote stories for women's magazines. Margery's aunt, Maud Hughes, also ran a magazine. Margery earned her first fee at the age of eight, for a story printed in her aunt's magazine.Soon after Margery's birth, the family left London for Essex. She returned to London in 1920 to attend the Regent Street Polytechnic (now the University of Westminster), and met her future husband, Philip Youngman Carter. They married in 1928. He was her collaborator and designed the cover jackets for many of her books.Margery's breakthrough came 1929 with the publication of her second novel, The Crime at Black Dudley. The novel introduced Albert Campion, although only as a minor character. After pressure from her American publishers, Margery brought Campion back for Mystery Mile and continued to use Campion as a character throughout her career.After a battle with breast cancer, Margery died in 1966. Her husband finished her last novel, A Cargo of Eagles at her request, and published it in 1968.